(1:15 p.m. EST) -- Royal Caribbean is testing a new pricing strategy at Johnny Rockets on select Oasis of the Seas sailings -- one that brings the cover charge up from $6.95 to $9.95. Cruise Critic first heard of the new cover charge on the Royal Caribbean forums, where member Milwaukee Eight posted: "Just read online, Johnny Rockets increased cover to $9.95 on Oasis." A spokesperson for Royal Caribbean confirmed the report to Cruise Critic: "This is just a pilot that applies to a small group of sailings, and at this time we do not have plans to roll it out to any other ships or beyond the select sailings on Oasis." 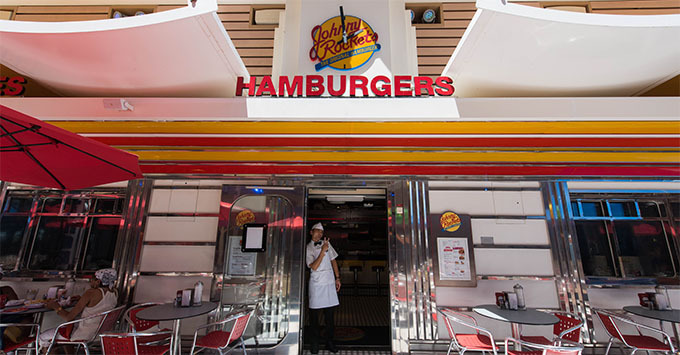 Johnny Rockets is a casual eatery, designed after the land-based venue, that focuses on burgers and shakes; it is found on several Royal Caribbean ships. Breakfast will remain complimentary. Members on the forums were generally less than enthusiastic about the change. "Well $9.95 plus gratuity just priced me out," said Cruiselvr04. "I'll get a burger in the windjammer. The fries there are actually pretty good...and free. We have gone to JRs a few times but not anymore. They are pricing us out of the specialty restaurants too except for special occasions." Meanwhile, others like FPP777 didn't seem too fazed: "People will still pay it for various reasons. My family of 4 will be cruising later in the year. We already picked a night the Mrs and I will be going to Giovanni's and the teens were told they were going Johnny Rockets, so I will pay it. And if I feel like a burger at some point, I'm not going to let 3 or 10 dollars stop me."